At 8.25 in the morning we started our tour to Cajon del Maipo. Everybody was aboard and Felipe, our guide, suggested we get some rest during the drive from the city. He spoke in Spanish first (3 of the passengers were from Argentina, 4 from Brazil, 1 from China, 1 from USA, and me, from England), then repeated in English. It took around one hour to get to the small café at the entrance to the canyon, where we stopped for morning beverages. We had a small slice of cake each. The group talked amongst themselves, learning about where everybody was from and where they were going. I was still sleepy-eyed when we entered the café, but during the drive afterwards, the scenery crystallised. We were driving into a verdant valley, mountainous walls rising either side of the road, snowy peaks growing in size, the closer we got. 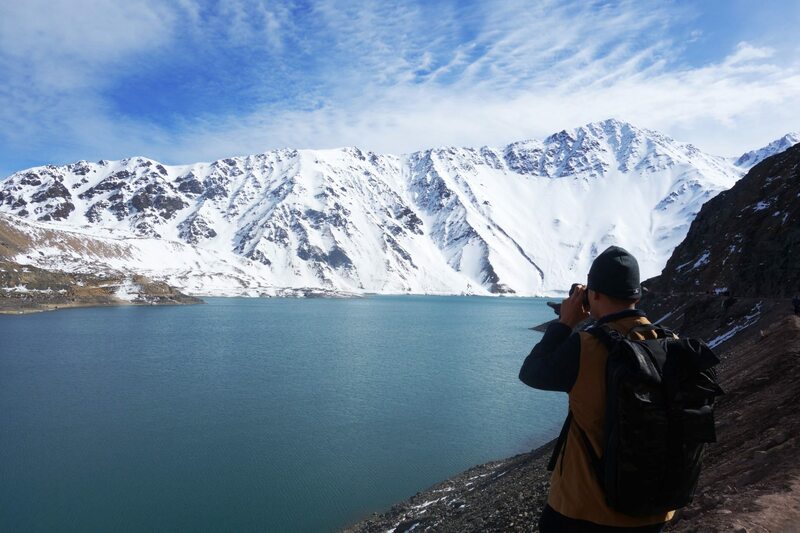 This was Cajon del Maipo. This is what I’d seen in all the photographs beforehand. The guide spoke excellent English. He was friendly and eager to answer any questions, not just about the tour, but Chile in general. We drove through the small village of San Jose de Maipo, established in 1792. To officially become a village, it had to build a little church, a hospital, and a town hall. It was originally home to the miners of the region, who mined silver and gold. Nowadays, they sell handmade goods, made from the precious minerals. The guide continued to talk as we passed through the village and the surrounding canyons. The river Maipo that runs through this valley, winding its way through the jagged terrain, is of great importance to Santiago. It provides electricity for the capital, but also acts as a gateway to nature, with lots of choices when it comes to adventure sports. You can kayak and raft on the river, and many Santiago dwellers come here on weekends to get out of the smog of the city. The crisp mountain air refreshes your body and clears your mind. We continued further into the canyon. We drove past a small train track, with a few stationary trains. Felipe explained they used to take Copper out from the mines, to Santiago. In 1985, they removed most of the track. Also Pinochet, Chile’s old dictator, used to live here. We drove past his old house, but I was taking in so much information, so quickly, that I didn’t actually see it. It’s somewhere in the valley. I’m pretty sure it’s there. 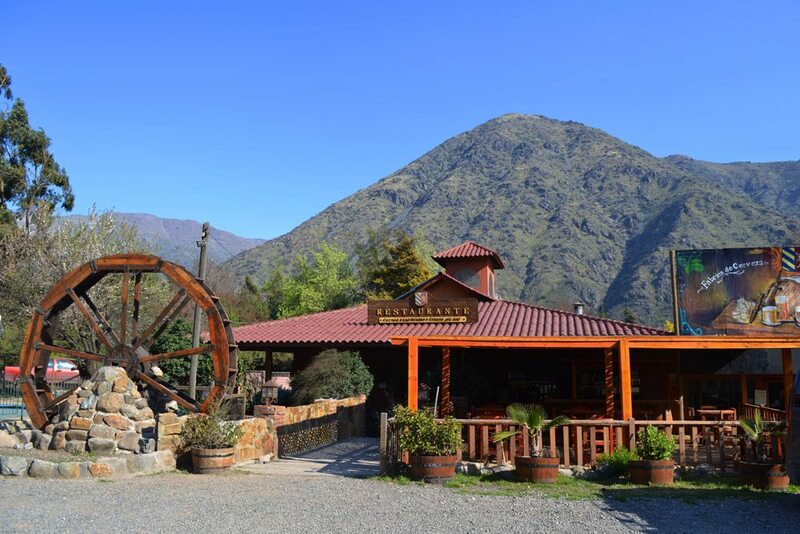 Before I could contemplate what Pinochet had done, we whizzed through another small village, learning about the Almond trees of the area – Cajon del Maipo’s biggest export. Finally, after almost 2 hours driving, we were able to stretch our legs and take a few pictures. It was possible to see the glacier atop the summit of the mountain – a giant slab of ice, perched precariously on the edge. The place appeared to be full of large bomb shelters. They looked like something plucked straight from a war film, but Felipe told us that they were occupied between 1953 and 1964 by the builders of the nearby dam. They have curved roofs to deflect wind and allow snow to fall off. However, they don’t have windows, and the builders had to live in freezing cold temperatures for the entirety of the project. After 20 minutes strolling around here, we drove onto the dam, a short hop down the road, where we left the bus again to explore the beautiful 4 winds corner. It’s not hard to see how it got its name. Before you know which way to turn, you’re blown in several directions, dust stinging your eyes and trapping itself behind your eyelids. Mini tornados swoop over the water in the distance. A crowd of fellow tourists huddle on the corner, struggling to stand up straight while taking selfies, asking me to take photos of them. When I was free from my role as an unpaid photographer, I took some photos of my own. The reservoir was just stunning. The snow-tipped mountains enhanced the appearance of the man-made lake. After a short drive back the way we came, we pulled over to the side of the road, and Felipe told us he’d arranged a picnic. A table was arranged on a little hill, with a trickling waterfall in the rocks behind it. There were olives, little bits of carrot, and bread. The dip for the bread was a mixture of soy sauce, sesame seeds and philadelphia. It was a bizarre mix – one I’d seen another Chilean eat, earlier that week. It wasn’t three things I’d have chosen to put together personally, but it was surprisingly good. Maybe this is eaten everywhere and I’ve just never heard of it, or maybe it’s a modern delicacy of Chile. Either way, it’s definitely worth a try. There were a few bottles of wine to share between the group, too but I’m not much of a wine drinker. After we finished the small picnic, we headed back in the van and drove out of the canyon and to one final stop. The empanada shop. Felipe suggested that we all try pino, because it is the flavour of Chile. He convinced each and every one of us to order a pino empanada which was actually good because it tasted amazing. When we finally finished we all hopped back in the car and drove to Santiago, just in time for rush hour. I didn’t get back home till gone 6, but Felipe was helpful in pointing out places to visit in the city, including an ice cream shop that does Aji flavoured helado! I haven’t tried it yet, but it’s on my list of things to do before I leave Chile.